So my wife and I are about 95% sure we will be purchasing an RV soon but before we do I'm reaching out for a little help on situations. The RV we are looking at is a 21 ft pull behind. The hitch weight is 427 lbs and the total weight of the trailer is 5295 lbs. Is there a need is getting a weight distribution hitch? This will be my first camper I pull, so I'm pretty new with towing. Any help or any other insight would be appreciated. The first rule of towing is never believe the sales sheet specs. How certain are you of those numbers? You'll also want to know what the fully laden weight is with fluids, gear, groceries, etc. Given the size and weight it doesn't seem like you'll need a WD set up though. Do you have a brake controller already installed? I should stop having my suit dry cleaned, it seems to kill people. I'm not worried, I have a Titan with 4wd and a pair of balls. You can lead a moron to knowledge but you cannot make him think. I should probably buy more bullets. I do have a brake controller already installed..... GVWR is 6695.... again I'm going on what the spec sheet says. I would use one for sure. It equals out the load for handling, and reduces sway. Both critical in towing. Definitely get yourself a WD. It's almost never wrong to use a WDH, mainly because most of them come with sway control built in. If you never encounter wind or other vehicles passing you then a WDH is probably optional. Using a WDH usually results in a much more comfortable towing experience. Some Titans are a little light on how much trailer they can handle. It mostly comes down to if you have the tow package and the lower rear end axle ratio (3.36 vs 2.95 - 3.36 is better for towing). Look at the sticker on the driver's door frame. It will tell you the cargo capacity of the truck. As I recall, mine was somewhere around 1300 lbs, maybe less. This is as much weight as your truck is rated to carry. The tongue weight of the trailer is deducted from this amount. That leaves you a few hundred pounds for other cargo (people, luggage, etc). The max tongue capacity of my Titan was 940 lbs as I recall. The owner's manual had a nice set of tables that let you know exactly what yours capacities are by matching your truck's features to those listed in the table. Your setup is pretty much the same as mine. 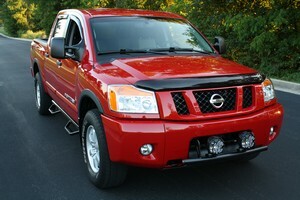 I use a WD hitch and Timbren spring assist as the rear leafs tend to be pretty soft on the Titan. Since last towing season I have added Bilstien 5100 shocks to the rear as well so I'll be looking at the setup on the WD soon. The WD makes it much easier to get the truck level as opposed to nose high while towing which affect steering feel and gets you a lot of high beam flashing while driving after dark. You really can't go wrong for the investment as it can be moved from trailer to trailer and pays off in more relaxed towing. That’s a bit of weight for only 21 feet of trailer, which one is it? Last edited by Clint; 03-26-2019 at 04:48 PM. '04 Jayco Jayflight 21FB, 4060 lbs. dry, 5800 GVWR. Not a "light" one, full steel frame and sturdy. We like it for the 2 of us, queen bed in the front and I've added a few enhancements to the storage to allow for easier packing. Pulls easy with the Titan. Thanks for all the insight.... We live in south Texas so it's rarely extremely windy. The trailer we are sold on is a Grand Design Imagine series. Here is the link for it. GVWR is 6700 lbs. THAT is the weight you should be focused on. Still within the Titan's towing capacity even if you didn't have the tow package. Very nice, if needed can you use it with the slide in? I’ve seen some you can’t walk through unless it’s open. What’s the list price on that one? I would say absolutely on the WDH. There are lots of fancy options out there, but with a smaller lightweight trailer you don't necessarily have to go high end. I tow a Jayco X19H (21' total length and around 5K lbs loaded). I have a simply Husky roundbar hitch with anti-sway. As simple as they get, and not overly expensive. You will certainly feel the difference in handling as the weight is returned to the front axle of the truck and you tow much more level. Note that you may need the longer drop shank than stock for the Titan/Jayco combo depending on the TT frame height. With a small trailer and taller truck it is worth knowing the hitch and coupler heights when ordering your WDH setup so you have the correct range of adjustment. Also, get a WDH with the correct bar weight range for your trailer; bigger is not better with a WDH, the bars should be matched properly to the actual load. You can use it with the slide in.... That was one of our main selling points with this model. List price was 37k but I've been playing 3 dealerships and have got them down to 22k drive out. My job is a contract negotiator so I'm a sales mans worst enemy.... Same with my titan. Just trying to work out the towing aspect of it now. What a great price, I’d buy one. Good luck.